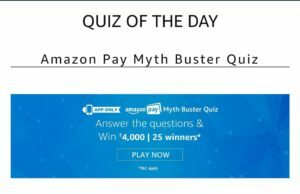 1 How to win Rs 4000 from Amazon Myth Buster Quiz? 2.3 Q2) What will the Amazon delivery agent do if you pay online in advance but are not at home to receive your package? 2.5 Q3) Which of the following can you NOT do if you pay online but decide to return your return-eligible order after delivery? 2.7 Q4) When you make a purchase with a ‘No Cost EMI’ on Amazon.in, which of the following would NOT be true about the transaction? Amazon is back with a new Quiz, and we added all the answers of Amazon Myth Buster Quiz. In this quiz, 25 winners will get Rs 4000 Pay Balance just by answering 5 simple questions. 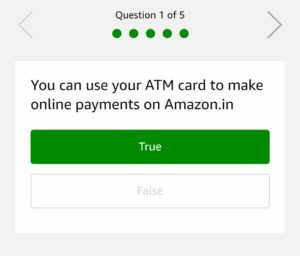 We also added answers of all other live quizzes by Amazon alongwith Myth Quiz. So, just check this post to get detailed information on Amazon Myth Buster Quiz Answers. 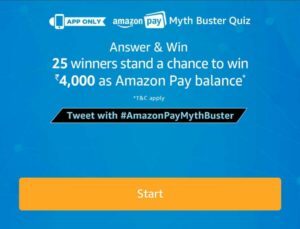 Just answer 5 simple questions to get a chance to win Rs 4000 from Myth Buster Quiz. This quiz will remain live until 20th May 2018. You have to go to the bottom of the Amazon App Home page to enter this quiz. We also added Amazon Myth Quiz Winners List, you can check that from the below mentioned link. 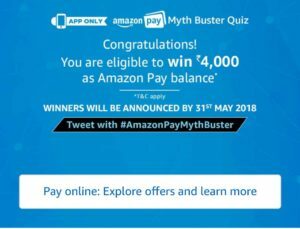 How to win Rs 4000 from Amazon Myth Buster Quiz? 2. Open the app and you will see a banner about the Myth Buster Quiz Time contest. Click on it. 3. Now click on the ‘Start’ button to begin the Amazon Myth Buster quiz. Q2) What will the Amazon delivery agent do if you pay online in advance but are not at home to receive your package? Q3) Which of the following can you NOT do if you pay online but decide to return your return-eligible order after delivery? Q4) When you make a purchase with a ‘No Cost EMI’ on Amazon.in, which of the following would NOT be true about the transaction? 5. After answering all 5 questions correctly. That’s it. Just wait for the Winners list of Myth Buster Quiz. There are a total of 25 (Twenty-five) Prize(s) that will be given under this Contest. The Prize will be delivered to the winner on or before 30th May, 2018. A participant will be eligible to win only if he/she has participated in the Contest in the manner provided under the ‘Details of the Contest and How to Enter’ section above. “Amazon Pay Balance” is a sum of all the balances associated with Amazon.in Gift Cards (“Gift Cards”) and ‘Your Money’ in your Amazon.in account. Amazon.in Gift Cards are issued Qwikcilver Solutions Private Limited (“Qwikcilver”) and are subject to the Amazon.in Gift Card Terms and Conditions (“Gift Card Terms”). ‘Your Money’ balance is issued by APIPL and is subject to the Amazon Pay balance Terms & Conditions. The Amazon Pay balance will expire after 1 (one) year from the date of issuance. Amazon Pay balance cannot be used to purchase other gift cards or balance. Amazon Pay balance cannot be reloaded, resold, transferred for value or redeemed for cash, except to the extent required by law. 1. This Contest will commence on 13th April from 12:00:01 a.m. to 20th May 23:59:59 p.m.